As if the world needed another reason to find giant walls bordering off an entire race of people an absolutely terrible idea, here comes the first major co-production between China and the United States to horrify us even more. The Great Wall, directed by acclaimed Chinese auteur Zhang Yimou of House of Flying Daggers and Hero fame, is the most expensive film to ever be filmed exclusively in China, which would not be possible without the financial and production co-operation of American studio Legendary Pictures. However, early signs of disaster were predicted once a small wave of controversy emerged when it transpired that in a film made by and starring Chinese filmmakers, it would once again be an American white man in the starring role – in this case, Matt Damon – and not to mention the trailer revealed a more, erm, monstrous approach that placed it exclusively in fantasy, which given Hollywood’s known fetish for mucking around with actual history to make entertainment was almost immediately a cause for alarm. As it turns out, both those things are the least of the film’s problems, because The Great Wall is a bafflingly terrible film for many other inconceivable reasons. Basically, in this film’s distorted reality, the Great Wall of China has been built to not keep out those pesky Mongolians, but instead prevent an entire hoard of green, horribly-pixelated monsters known as the Tao Tie getting through. The Chinese army seems to be struggling until – lo and behold – Damon and his plucky sidekick Pedro Pascal stumble upon the Wall and almost immediately provide an answer to their problems. There’s been a lot of heated discussion leading up to this film’s release about the “white saviour” role that Damon had been cast in, and now having seen the film it can sadly be confirmed that not only is his character regarded as a genuine hero, uncomfortably more so than a lot of the other Chinese characters, but the numerous ways he fights off the horrible visual effects masquerading as evil monsters pretty much makes him an invincible superhero, removing any compelling nature to his dull-as-cardboard role. Seriously, to those complaining about Rey from The Force Awakens being a Mary Sue, I ask you to kindly direct your attention to a character that actually deserves that ridicule. But again, Damon’s white saviour role is the least of the film’s problems. For one, the editing in this movie is atrocious; from the very first frame, you’re just completely lost and without a clue of what’s going on or who any of these people are. The opening assault on the wall by these monsters – which again, are brought to “life” by some truly awful visual effects – doesn’t so much leave you with a sense of awe, but an inner desire to yell at the screen “WHAT IS GOING ON?!? !” since it throws you almost instantly into this situation without any explanation or build-up as to what it is they’re fighting. There are a lot of times throughout the movie when the editing will just skip corners and make the narrative even more frustrating, like characters will say they will do something or be somewhere in one scene and then the very next shot is of them doing that something or being that somewhere, which can be quite a nightmare for anyone struggling to keep up. It also makes things feel rushed, so much so that not only do you never get to really know these characters, but even the Chinese subtitles go by so fast before you can have a chance to read them. The movie’s bad enough with its clichéd script and dialogue, not to mention its uncomfortable positioning of its Mary Sue white male lead as the film’s unstoppable hero, but this abysmal hack-job in the editing room is a fireable offense, especially for something as expensive as this. I’m aware that I keep repeating how the visual effects in this movie are horrible, but it’s true; this is CGI that wouldn’t even be worthy of a cheap PS3 game, let alone a $150 million Chinese epic like this. The Tao Tie look absolutely terrible, and aren’t even that scary or creative; they’re just a poorly-rendered version of the kind of monsters you’ve seen many times over, and not once ever convince you that they are really there terrorising this Wall. It’s not limited to the monsters, either; there are numerous green-screen shots where the actors are put in front of backdrops that never seem real, which again in scenes of action fail to convince that they’re actually pulling this off. There’s a scene where Damon – who sports an odd accent throughout the movie that’s sometimes Irish, sometimes Spanish, all times nonsensical – and another character are standing over a large drop from the Wall to the ground, but it looks so fake that even those with a fear of heights will feel completely at ease, because it doesn’t look real in the slightest. However, probably the worst thing about the film is that it’s so boring. For all its promise of the insane monster action from the trailers, nothing about it ever warrants any interest because you don’t know about these characters, and what little you do know you don’t care that much for anyway, the plot is so nonsensical and thanks to some terrible editing moves by so fast without offering a full explanation of what’s going on, and aside from a couple of colourful visuals with the numerous costumes, it’s not even that entertaining to look at. If it executed a number of things a lot smoother and a lot less scrambled, this could have been a dumb, fun action-adventure movie that signalled a fresh new beginning in film collaborations between America and China. But instead, The Great Wall is anything but great, and is a pretty terrible start to those proceedings. Let’s hope that both sides of the collaboration can make a more audience-friendly flick for their next outing together. 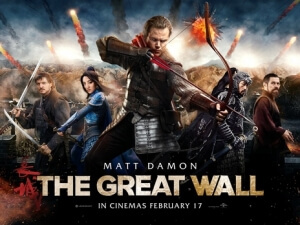 The Great Wall is a terribly-executed action-fantasy film, with its atrocious editing, horrible visual effects, and uncomfortable positioning of Matt Damon in an unmistakable white saviour role in an otherwise mostly-Chinese film, all adding up to being a dismal failure for what was meant to be the first of many major collaborations between China and the US, a concept that seems a lot more wobbly now that this movie has debuted.